The year is 1565. On the Island of Malta, 600 Knights of St. John, commanding a force of some 8000 men, prepare to defend their island fortress from attack. These same Catholic Knights had been driven from their previous stronghold, the Isle of Rhodes, in 1522, by the Ottoman Turks. Under Suleyman the Magnificent, the Moslems were pressing hard across Arabia, Syria, Iraq, into Egypt and northern Africa, and had established a strong foothold on the north coast of the Black Sea, the gateway to all of Europe itself. In 1526, the Hungarians had been defeated at the Battle of Mohacs, and only the Austrian Habsburgs now stood in the way of the Moslem advance. Vienna came under attack in 1529, but the Moslems were unable to take the capital, and their over-extended campaign failed. Now, the Turks had raised a fleet of 181 ships, carrying some 30,000 soldiers, and Malta was the prize they sought. Their goal was to plunder and sweep all the ships of Christian Europe from the Mediterranean. Then, in control of the sea lanes and trade routes, with their naval and economic power supreme, all of Europe would be set to fall before them. 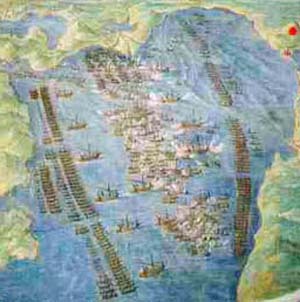 The Turkish fleet appeared off the coast of Malta, and laid siege to the island. All through the summer of 1565 the contest for Malta raged. In the end, the Knights of St. John (Knights of Malta) were victorious, and the Turks were forced to withdraw in defeat. It did not, however, end the threat from the Ottoman Turks. In 1566, Pius V ascended to the Chair of St. Peter in Rome. Pius V was a Dominican Monk with a reputation for piety and austerity. A teacher of philosophy and theology for 16 years, unlike some previous Popes, he was a humble man who continued to lead the ascetic life of a simple monk even after becoming Pope. Pius V was also very serious about defending Christendom against the Ottoman Turks. He knew they were not just going to go away and leave Europe in peace. Vienna and the eastern borders continued to be threatened by Moslem military power and incursions, and the Papal States themselves could soon be at risk. Cyprus came under attack again in 1570. Seeing the increasing danger to Christendom, Pius V called on "The Holy League," consisting of the Papal States, Spain, Genoa, Venice, and the Knights of Malta, to address the Moslem threat. 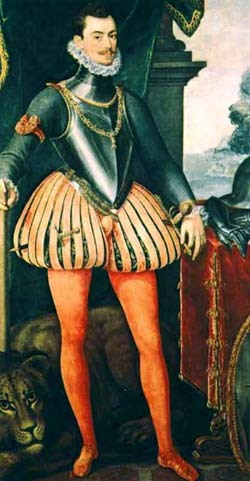 A Christian naval fleet was assembled under the overall command of Admiral Don John of Austria. Although young (in his twenties), Don John was a capable naval commander. The Spaniards were led by Santa Cruz, the Genoese by Andrea Doria, and the Venetians commanded by Agostin Barbarigo and Sebastian Veniero. The fleet under Don John's command was some 300 ships strong, with over 100 ships and 30,000 men being supplied by Philip II of Spain alone. The Pope personally outfitted and supplied 12 Papal galleys, and provided funding for many of the others as well. 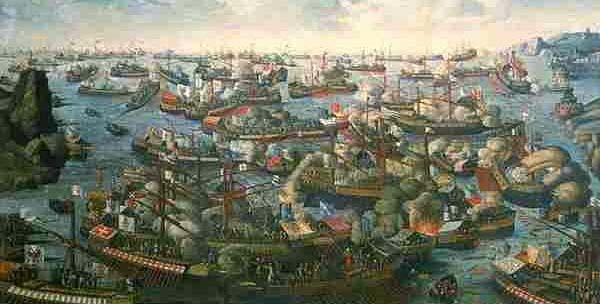 The Venetian contingent was around 100 ships, manned in part by additional Spanish soldiers. In the Venetian fleet were six galleasses. Heavier, broader, and much slower than conventional galleys, they were nonetheless technologically advanced - the heavy gun platforms and battleships of their day. All total, over 50,000 men served the fleet as rowers, and another 30,000 were fighting soldiers. In September of 1571, Don John moved the Catholic fleet east to intercept the Turks at Corfu, but the Turks had already landed, terrorized the population, and then moved on. While anchored off the coast of Cephalonia, news reached Don John that the Christian stronghold at Famagusta on Cyprus had fallen to the Turks, with all prisoners being tortured and then executed by the Moslems. Don John then pulled up anchor and moved to engage the Turkish fleet in the Gulf of Lepanto, off the southern coast of Greece. The Turkish fleet, some 330 ships strong, under the command of Ali Pasha, had been reinforced by Uluch Ali, the Bey of Algiers, and head of the notorious band of Moslem corsairs (pirates) that had long terrorized Catholic ships in the Mediterranean. On the night of October 6, with a favorable wind behind him, Ali Pasha moved his fleet westward toward the mouth of the Gulf of Patras to intercept the approaching ships of the Holy League. The clash that was to come would be the largest naval engagement since the Battle of Actium in 30 B.C. At dawn, on October 7, 1571, the two fleets met. Don Juan split his fleet into three sections: on the left (north), the Venetians under Agostin Barbarigo; on the right (south), Andrea Doria led the Genoese and Papal galleys; in the center, Don John commanded his flagship and galleys. 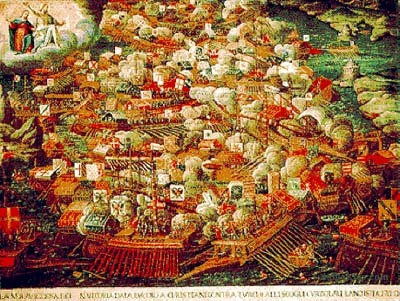 Santa Cruz, with a force of 35 Spanish and Venetian ships, was held in reserve. He ordered his captains not to fire until “close enough to be splattered with Moslem blood.” The iron rams were removed from the Christian ships, as the plan was for boarding and close quarter fighting. Two of the large Venetian galleasses were towed into position in front of each of the three Christian divisions. Ali Pasha's fleet approached in a giant crescent formation, and seeing the opposing fleet, he also ordered his fleet split into three divisions. Ali Pasha himself took up the middle position opposite Don John, and charged forward to engage Don John's ships. 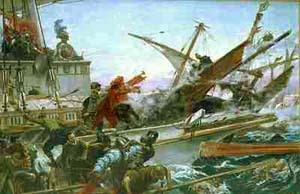 The Venetian galleasses opened fire, and almost immediately eight Moslem ships were hit and began to sink. The Catholic galleys, their decks filled with soldiers, opened fire with arquebuses (1) and crossbows as the Moslem ships drew alongside. Ali Pasha's men attempted to board the Catholic ships, but the Spanish soldiers were experienced and well disciplined. Attack after attack was beaten back with deadly shots from their crossbows and arquebuses. Don John ordered the ship of Ali Pasha to be boarded and taken. Two times the boarding attack of the Spanish soldiers was beaten back, but on the third attempt they swarmed over the deck, now awash in blood, and took the ship. Ali Pasha was captured and beheaded on the spot (against the wishes of Don John), and the Battle Flag of the Ottoman Fleet came down off the mainmast. The head of the Turkish admiral was spitted on a long pike and raised on high for all the enemy ships to see. The Turkish attack in the center collapsed, and Don John sent his ships in pursuit of the retreating Turks, and also turned to aid in the battles raging on his flanks. On the Catholic right, Uluch Ali and his pirates had broken through Doria's lines and managed to capture the flagship of the Knights of St. John. Santa Cruz, seeing what had happened, came up to the rescue, and Uluch Ali was forced to abandon his prize. The Genoese were in a fight for their lives with the remainder of Uluch Ali's ships, but after Don John had broken the enemy fleet in the center, he turned and came to the aid of the Genoese. The Algerian corsairs were finally overcome, and fled for their lives in full retreat. Admiral Mahomet Sirocco, commanding the Turkish right (on the Catholic left), sailed close to the rocks and shallows on the northern shore of the gulf and was able to outflank Barbarigo's Venetian galleys. Barbarigo's flagship was surrounded by eight enemy galleys, and the Catholic Admiral fell dead from Turkish arrows. His flagship was taken for a time, but aid finally arrived, and Sirocco's flagship galley was sunk. The Turkish admiral was yanked out of the water, and, like Ali Pasha, killed right on the spot. The engagement lasted, all total, around four to five hours. When it was all over, 8,000 men who had sailed with Don John were dead and another 16,000 wounded. The Turks and Uluch Ali's corsairs had over 25,000 dead, and untold thousands more wounded and captured. Over 12,000 Catholic galley slaves had also been rescued from the Moslems. The Venetian galleasses had taken a heavy toll on the Turkish fleet. It was a major victory for the Holy League and Christendom. "A truce to business! Our great task at present is to thank God for the victory which He has just given the Catholic army." When news of the victory finally reached Europe, church bells rang out in cities all across the continent. 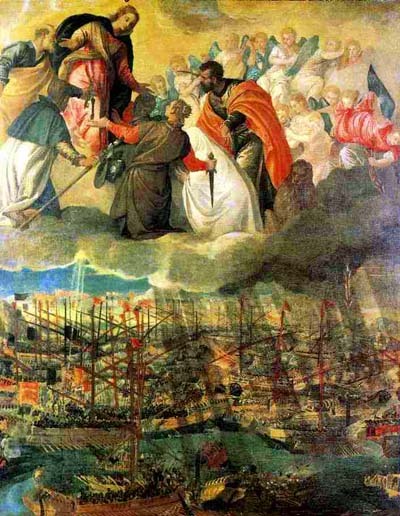 The Battle of Lepanto was a decisive victory, with only 40 of the over 300 Moslem ships surviving the engagement. The Turkish force of some 75,000 men was in ruins. The battle, although a great victory for Catholic Europe, did not end the threat of invasion, or completely break the power of the Ottoman Turks. More naval and land battles would follow in the years to come, and Vienna itself would come under attack again, and yet again. Today, the long clash between Christendom and Islam is still evident in the political and ethnic geography of Europe, Africa, Byzantium, and north into Russia. The battle also extends, in varying degrees, throughout the Near and Far East, and the Islands of the Pacific as well. Many Christian knights, soldiers, and sailors have died defending Christendom against the onslaughts of Islam down through the centuries. Today, the borders of many European countries, Canada, and the United States are practically wide open, and the old enemy is invited to come in and make himself at home. And many 'Christians' in the West are just too busy enjoying their material prosperity to be bothered with unpleasant history. But the enemy has not forgotten history. He remembers it all too well, and he is still deadly serious about his religion. His goal over the years has not changed in the slightest, and he is very patient. The enemy within is now smiling, just biding his time.